Hard to believe, but Project Involve is finally old enough to rent a car. That’s right: throughout 2018 we’ve been celebrating the 25th anniversary of Film Independent’s signature diversity and mentorship program, first with a series of video profiles of some of our favorite PI alums and now with a special anniversary screening of the short films produced as part of this year’s program tomorrow night, Thursday, September 20, on Day One of the LA Film Festival. Including the world premiere of Liberty—the very first Project Involve short to ever be shot outside of Los Angeles. Shot on location in Miami’s Liberty Square neighborhood, Liberty tells the story of best friends Milagros and Alex, who have been chosen to dance at their housing project’s new groundbreaking ceremony—only to be confronted with intruders, interruptions by construction workers and bureaucratic red tape as they search for a space to practice, all the while holding on to the one thing they’ve always counted on: each other. In anticipation of the milestone short’s Thursday night debut, we asked Liberty’s creators and 2018 Project Involve Fellows—writer/director Faren Humes, producers Diana Ward, Katherine Fisher and Diego Najera and cinematographer Zamarin Wahdat (cinematographer)—to recount their experiences making the film. Here now is the filmmakers’ Liberty production diary, complete with amazing behind-the-scenes photography by Alex Harris @thesouthinanewlight. If you’d like to know more about attending one or our two Project Involve shorts screenings tomorrow, just click here. We filmed the last shot of the movie on the last day, the very last shot on the shooting schedule. Our lead character (Liberty) had braid extensions installed for the film. 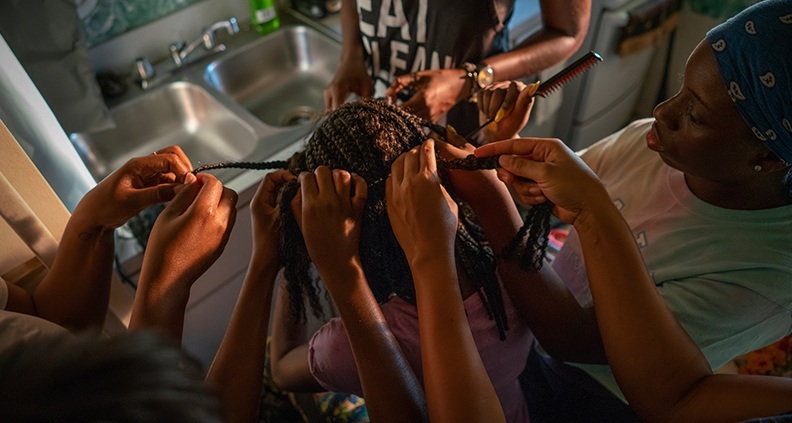 For the last shot, Liberty sits and has her last braid taken out by her best friend (Milagros), who then washes her hair. We had to get this shot in one take—uninstalling hair extensions is a one-time affair—but most importantly, it had to be emotionally heightened and aligned with the tonal trajectory of the film. In short; the actors had to get it right. And they did. Their energy, their evocation of reconciliation through touch, is a palpable experience and moves me more than any other scene I’ve directed. I learned of the Miami Northwestern dancers when they were under national scrutiny for the costumes they wore during high school football performances. They handled the media frenzy, the threats, the sexist remarks with remarkable aplomb. I knew our leads had to come from this group—led by Traci Young-Byron. From them, we found Alexandra Jackson and Milagros Gilbert. It poured down torrentially during this scene. Still, it seemed like each drop only fueled them further. They were the consummate professionals and their passion made the scene. 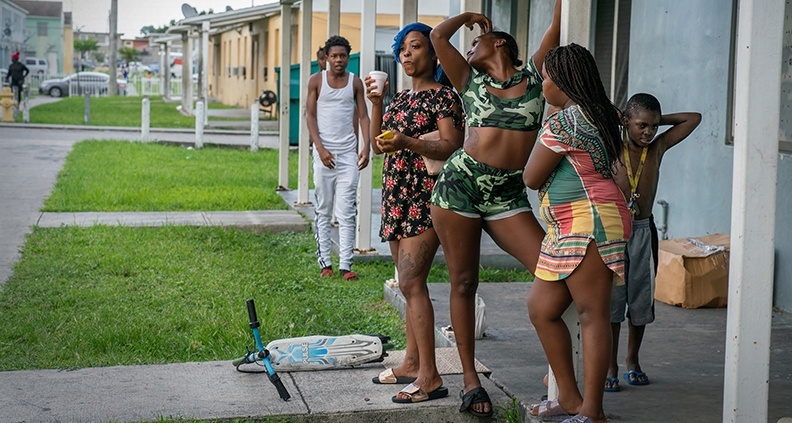 The woman with the frozen cup is Domonique Green, mother to Kimson Green—her only child, fatally shot two months prior to this photo capture. Her sister (Kimson’s aunt) Jessica Witt, stands next to her. On this day we had difficulty amping the extras for a high energy scene. Passing by, they hyped us: dancing, laughing, spreading love, then going about their day. Their dedication to each other speaks to the core of the film, the ability to thrive in spite of it all. They are images of resilience and unfettered prowess. Images of glory. I nearly overlooked Milagros Gilbert for the role. I auditioned the dancers on three different occasions and was ready to choose another dancer. It wasn’t until my mentor suggested Milagros again that I took a second look at her auditions. Her very nature—inward, stoic—is what makes it easy to bypass her, yet it is so vital for the role. It was such an overwhelming experience to direct her each day. To think I could’ve missed her! She simply got it. As production days went by and she realized this role was truly hers to have and interpret, she stepped into it, vulnerably and truthfully. She brought a special realness to the story that I’m so grateful for. Having had the opportunity to be invited and work with such a precious community in Liberty Square, Liberty became more than a film. Faren created an environment of trust and respect, and that was the foundation for a good relationship between the community, cast and crew. 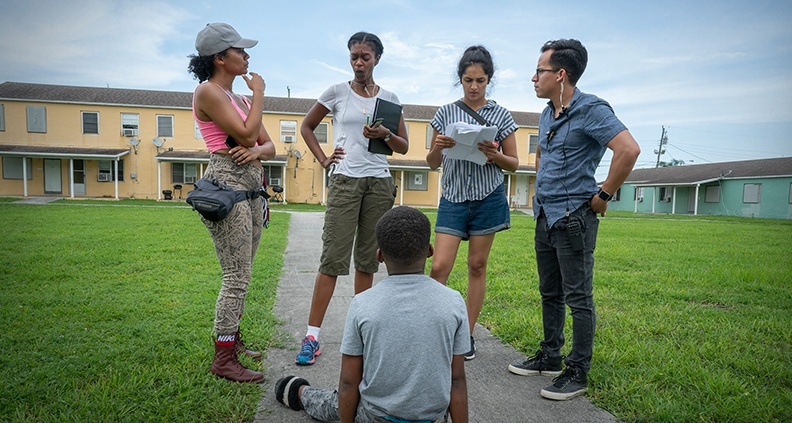 Here I am with location manager Keisha Witherspoon, Faren and producer Diego Najera, confirming where the stage for the ceremony will be built while a local boy watches us. We had a close collaboration between the departments, especially as we were working with very little equipment and a small crew. This was the first time we actually built a more elaborate stage for this shoot. It was all hands on deck and a great team effort to achieve it in 100-degree heat! This was one of the scenes where the weather really worked in our favor. 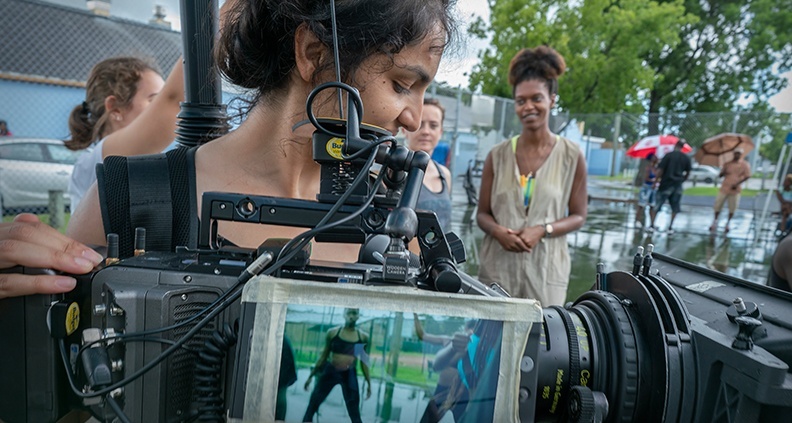 First Assistant Director Robert Colom and Faren watch the action while First Assistant Camera Terence Price II and I roll on a scene with leads Milagros Gilbert and Alexandra Jackson. We shot in July in Miami. Everyone familiar with Florida knows the weather changes from heavy rain to super bright sun within five minutes. Even though the weather was unpredictable, I found the clouds and thunderstorms in Miami irreplaceable. Whenever they appeared they added a specific atmosphere and layer to the film. Maybe it’s because I grew up in a very rainy town and I saw more clouds than sun in my life, but I feel storms always remind me that we are part of something bigger. Working in Florida definitely taught me how to work within every possible weather situation. I decided to use the Easy Rig for the dance scene, since it seemed very restrictive to the dancers to place them on marks. Going handheld allowed me to adjust towards them rather than the other way around. I found it important to capture the moment when working with these girls, there were so many beautiful moments. This was the first time a Project Involve film was shot outside of Los Angeles and none of us producers had been to Miami previously. So that was the first challenge. But we all knew this was a story of a place, and it had to be shot in Liberty Square. Two crucial decisions were made that ultimately had a huge impact on the outcome of this piece. One was the decision to shoot in Miami. The other was to cast entirely with local non-actors. While these decisions may have created the biggest production hurdles to overcome, they also yielded the most powerful results. Liberty is a story that needed to be told in this location, with people from this area. As someone who had never even been to Miami—let alone Liberty Square—I was struck immediately by how inspiring, creative, open and unique this place and its people are. To be a part of a film that captures that with authenticity and nuance was an incredible experience and a blessing. To me, this photo represents the beauty of this location: the intrinsic sense of place that you get at just one glimpse and the sense of community, growth, friendship and family that was created on set between our entire crew, cast and community. The setting for this story was as relevant as any of our lead characters. 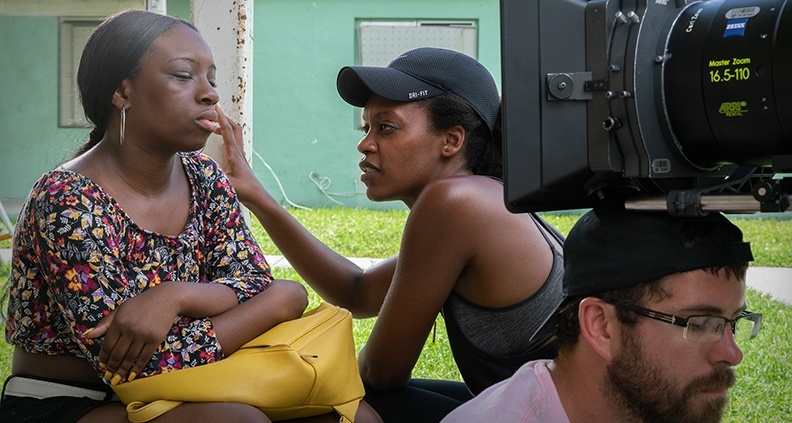 Our effort to shoot in Miami arose from the desire to capture the beauty and soul of the Liberty Square community. 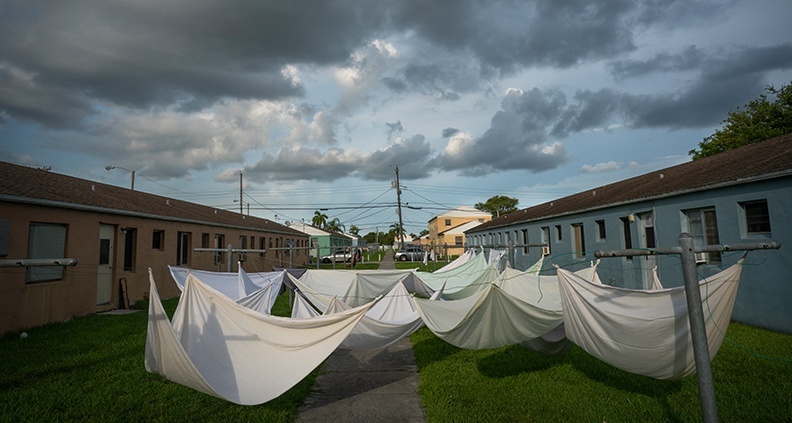 It’s a historic area of Miami that is bound to disappear in the near future due to redevelopment. While the community has struggled throughout the years, what we found was a place full of life and people that embraced our project thoroughly. The site was unique—composed of pastel-colored one-storied buildings surrounding large grass terraces. It was open, inviting and poetic. This image captures the work of our Production Design team led by Gabriela Soto, who embraced the existing spaces and dressed them slightly to help us tell our story. The community at Liberty Square were so kind and generous, giving up their time and public and private spaces to us—especially the talent that Faren found to be in the film. Mr. Calvin Bruce, along with Ms. Mary Griffin and Mr. McArthur Richard went above and beyond as cast in supporting Faren’s vision. 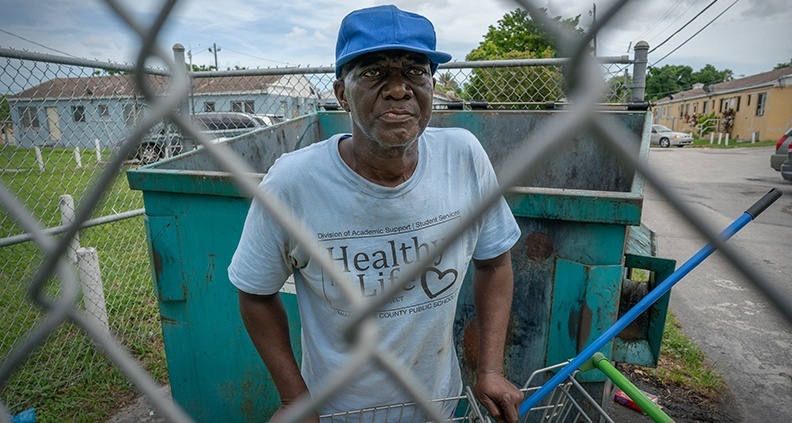 Mr. Bruce, seen here, is the community’s real life “treasure man.” He collects bits and pieces to repair and sell, as well as collecting toys and other items to donate to those without. He’s just one of the many people that were essential to the fabric of Liberty. For more information on additional Film Independent projects and programs, click here. To learn how to become a Member of Film Independent, click here. To meet the rest of this year’s Project Involve Fellows, click here. Be sure to follow the 2018 LA Film Festival on Twitter, Facebook, Instagram and YouTube. Visit our official Festival Store by clicking here. The 2018 LA Film Festival runs September 20-28.